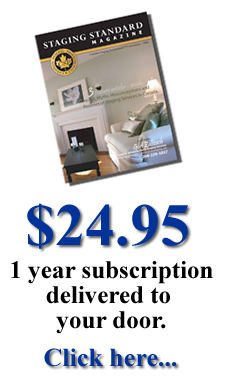 Real Estate Agents love the Staging Standard Magazine™, passing it along to their sellers after reading. Many who have been gifted the magazine by their real estate staging consultant use them in their listing packages to assist in selling the homeowner on the importance of staging prior to putting it on the market. Best of all, one publication can hang around the real estate office for months, making the longevity and value of the Staging Standard Magazine remarkable! The CSP® Staging Standard Magazine™ promotes awareness for the real estate staging industry through articles and photo documentation. Staging experts across Canada, the US and Australia submit articles of interest designed to enlighten readers on the staging industry as it is today. Readership consists primarily of real estate professionals, real estate staging consultants, home sellers, home buyers and other industry related professionals. Magazine content highlights staging market trends, staging statistics, case studies and industry news. Consistent delivery to the general public of this valuable information brings awareness to the staging industry. Although this glossy 16 page professional magazine is available to the public for an annual subscription, Certified Staging Professional® and CSP International™ Academy students have an additional opportunity to customize each for maximum benefit. The front cover can be printed with their own company branding, profile photo or logo. Each issue can also contain a message specific to their readership. Messages can include company specials, announcements and other company related news. Real Estate stagers who participate in this program enter their distribution list and it is directly mailed to their potential and existing clients. Additionally, home stagers often choose to utilize this unique marketing tool by ordering extras to give out during real estate presentations, tradeshows, open houses, and homeowner quotes, gaining credibility as a professional stager who provides their local market place with informative valuable information. Duncan Scott, CSP®, President of The Scotts Group Inc.
Every idea begins with a vision and Christine Rae, president of CSP International™ Academy, author of Home Staging For Dummies® and Winner of the RESA® 2009 Innovator of the Year, took her vision to create a marketing tool that would assist home stagers in their efforts to secure staging work to a publishing company in the USA. Combining efforts with Design by Publishing, CSP® launched the first CSP® Staging Standard Magazine at the CSP® Convention in 2006. Certified Staging Professional® is the leading staging training company in North America and Australia. Founded in 2005 by internationally – acclaimed staging expert, Christine Rae. The CSP International™ Academy delivers comprehensive training programs in staging, redesign, green science and marketing, and provides unparalleled after–training support to real estate professionals, stagers, professional organizers, decorators and entrepreneurs.